At Walker, we have lots of dads on the team. Surrounded by beautiful books, they are great advocates of reading to and with their children. We have dads with very young children, and dads whose children have since grown up. All have very happy memories of reading to their children. 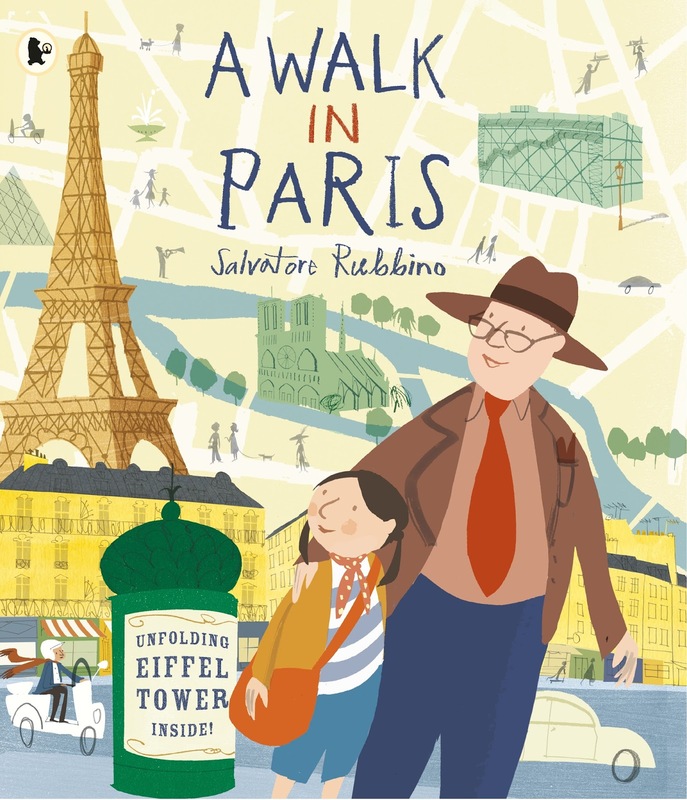 To celebrate Father's Day this Sunday, 21 June, the dads of Walker have shared with us the special books that they are currently reading or have enjoyed reading in the past with their children. Scroll down to hear what books have been particularly memorable. Recently I have most enjoyed reading Julius Zebra by Gary Northfield to my son Charlie (age 8). It makes him laugh; makes me laugh and reminds me just how crazy those Romans were. We will be taking on holiday to Rome this summer. I also know Migloo’s Day backwards having read it nigh on 50 times to youngest, Hugo (age 5). He’s obsessed with the characters and spotting them in the pictures and also insists on pronouncing Migloo as Migaloo. Don’t ask me why. I loved to read my children Dr Seuss books. One particular favourite was Fox in Socks. 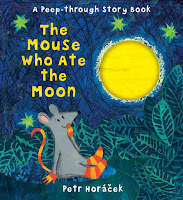 It's a longish text for a picture book, and principally of increasingly manic and increasing difficult tongue twisters. Reading the final pages out loud is a massively demanding exercise in verbal dexterity. By the end of the book I was always exhausted, hoarse and short of breath, but happy. Though I did fear the prospect of my son calling out, "again, again". Being 3 years old has many challenges. Apparently, it's quite difficult to remember that you shouldn't run in car parks, must eat your vegetables and that you generally aren't allowed to remove your knickers in a public place - so it's always nice to have a reassuring story to remind your little one that they aren't the only one who struggles with life's little temptations. Beautifully illustrated and printed in a striking orange pantone, Oh No, George! tells the story of unfortunate canine George who is locked in an eternal struggle with his inner dog. Having made the conscious decision to be good, George unfortunately faces a triad of temptation in the form of a yummy-looking cake, an illicit game of chase (with feline acquaintance Cat) and some deliciously diggable soil. Will George be able to resist temptation? Or will your reading companion be forced to bellow title "Oh No, George!" at tinnitus-inducing volume? "George wants to be a good boy", my daughter Ellie says "But he wants to eat the yummy cake! Silly old George!" "Who else wants to be good, but also wants to do things they shouldn't?" I ask. "ME!" Ellie says, shooting the cheekiest of grins. This is why Oh No, George! is such a special book. It's acted as creative and fun-filled gateway to explore the potentially thorny issue of behaviour without generating any tears. Either hers, or mine. 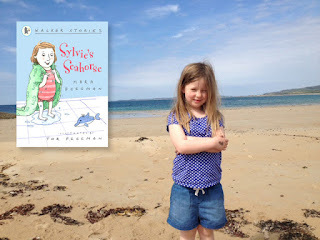 My daughter, Maya loves Sylvie's Seahorse by our very own Walker editor, Mara Bergman. She loves the seaside, swimming, fish and seahorses and this book really captured her imagination. But she now wants a pet seahorse! 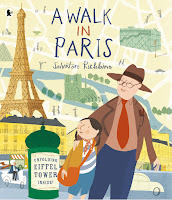 Lots of our picture bookmakers are dads too, so we also asked them which books they enjoyed reading to their children. I always look forward to reading the bed time story with my children. No matter what's happened during the course of the day; arguments or tears, worries or excitement - a story good story brings us all together. I especially like 'doing the voices' and sound effects to accompany the story, although I must say that my performances aren't always appreciated the way they deserve to be! 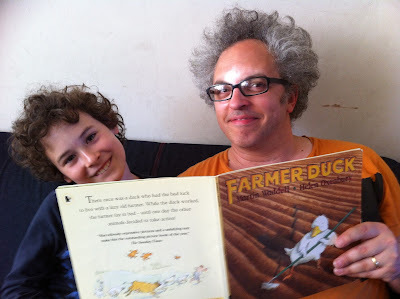 A family favourite is Farmer Duck by Martin Waddell and Helen Oxenbury. We often take turns to Moo, Baa, Cluck or of course Quack with this book. Is mummy like the overworked duck? Surely Daddy is not like the lazy bones farmer! Picture book author and illustrator Petr Horacek is known for his stories about Little Mouse, the most recent being The Mouse Who Ate the Moon and it's forthcoming sequel, The Mouse Who Reached the Sky. Petr has two daughters - Tereze and Cecilia. 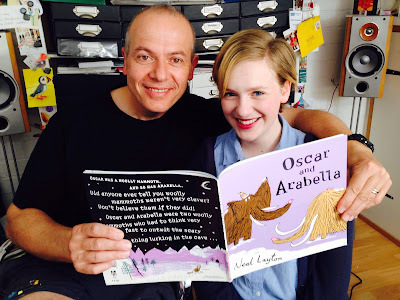 One of the books I used to read to my daughters was 'Oscar and Arabella' by Neal Layton. I love Neal Layton's illustrations, so I bought the book for myself, really. I kept it in my studio. Whenever Cecilia came to see me working, she sat on my lap and asked for a story. I grabbed "Oscar and Arabella". It's a funny story with made up facts about two mammoths. Cecilia liked the story and I loved looking at the beautiful artwork." Here is a recent photo of Petr and Cecilia reading Oscar and Arabella again. 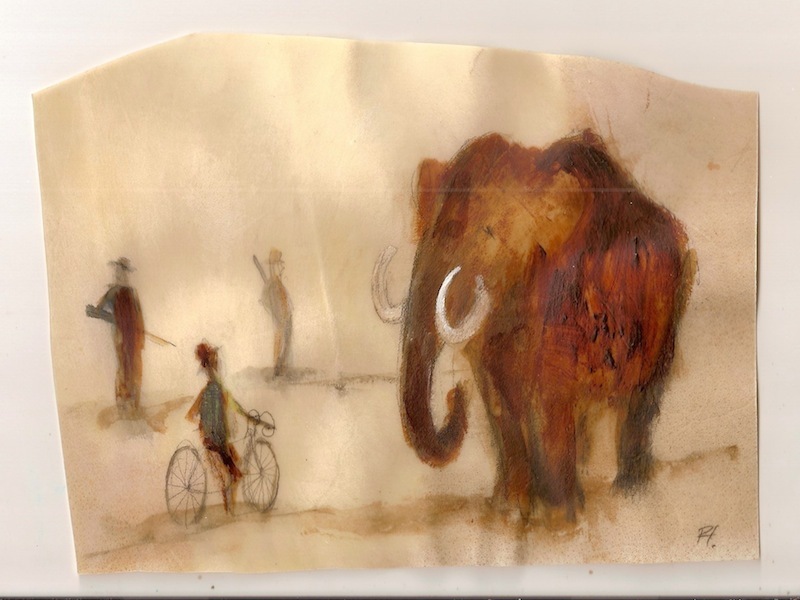 And here is Petr's own picture of a woolly mammoth that he was inspired to draw! Book of the month: It's a Groovy World, Alfredo!